In this 12-day MCSA: Cloud Platform and MCSE: Cloud Platform and Infrastructure course you'll become an expert in Microsoft cloud technologies and learn how to manage a modern data center. Using our Lecture | Lab | Review technique, your Microsoft Certified Trainer (MCT) will immerse you in Microsoft Official Curriculum (MOC). This technique, which combines both theoretical and practical tasks, will accelerate your learning as well as provide you with the hands-on experience you'll need to apply your skills to the real-world. 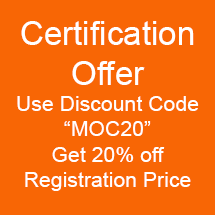 Included with Boot Camp - MOC digital course materials, labs, practice exam, and exam registration. Earning both the MCSA: Cloud Platform and MCSE: Cloud Platform and Infrastructure certifications qualifies you for a roles including cloud administrator, cloud architect, computer support specialist, and information security analyst.